Author: Neil Ward-Dutton, MWD Advisors. Low-code application development platforms can offer beleaguered teams huge benefits in terms of development velocity. However true application delivery agility – and through that, business agility – only comes when teams can optimise the whole delivery process. Few low-code application development platforms really work in ways that make that broader optimisation easy. The low-code application development promise – fulfilled by K2 (and other vendors and products, too) – is about speed and agility. It’s simple: when you write less application code, you make faster progress. The promise is enabled by tools that do the ‘heavy lifting’ of application development for you. They abstract away all the messy implementation details associated with low-level system interactions, as well as providing high-level specification tools specialised for building functionality that’s commonly required within particular domains. So, when you work with products from K2 and other similar vendors, you use high-level, graphical ‘model-driven’ specification tools that give you powerful shortcuts to developing workflow management functionality, task interaction forms and other application user interface elements, business data management functionality, reports and dashboards, and so on. The tradeoff that comes when you use low-code application development platforms like these is that the code that does the ‘heavy lifting’ to deliver working application functionality behind the scenes is, by design, hidden from you. Some generate all the low-level code necessary to run applications standalone, and others provide high-level specifications that are interpreted by a proprietary application server at runtime; however all low-code application development platforms are in essence proprietary. As the promise of low-code application development becomes more widely realised and organisations deliver more applications with speed and agility, so the applications they’re used to create are becoming more sophisticated, numerous and business-critical. It’s natural, in these cases, for organisations to make application quality assurance a high priority. What’s more, broader ‘DevOps’-related application delivery trends like continuous integration/continuous delivery – driven by cheap and flexible cloud infrastructure – depend on the ability to rapidly test and re-test application functionality. When it comes to low-code application development platforms like the K2 platform, though, the most widely-established general-purpose software QA toolsets and approaches have limited applicability. This is the challenge that PowerToolz aims to address. Low-code application development platforms can offer huge benefits in terms of development velocity. However true application delivery agility– and through that, business agility – only comes when teams can optimise the whole delivery process. Few low-code application development platforms really work in ways that make that broader optimisation easy. jeylabs’ PowerToolz offers a suite of integrated automated testing and administration tools designed specifically for the K2 low-code application development platform, and through that, addresses the broader delivery agility challenge for K2 customers. All the core test automation bases are covered, and offered at a compelling price point. What’s particularly noteworthy is that by using the K2 application repository itself to store and manage testing artefacts alongside K2 application artefacts, PowerToolz delivers a number of significant quality management benefits that will help teams work with K2 quickly and effectively at scale. You can download and evaluate the software from the PowerToolz website at https://powertoolz.com.au. If we could live in a perfect world nothing would ever fail, however, the reality is everything is somewhat flawed; errors and mistakes are simply a part of life. Within the software world, this is no different. All software is prone to have bugs and studies have shown 50% of software projects fail. It is impossible to test every aspect of a complex software program manually. In addition to this, we as humans cannot fully comprehend our wants or needs until we have a seen it in some form. This is the reason why many users and system owners change their “requirements” after the design is completed. In fact, an average software development project experiences more than 20% change in requirements from the design stage to its first release. These changes are a common problem that impacts nearly all software projects. This calls in a very important question; how do we combat this? If we cannot eradicate an error we must minimise it. Most software dev teams implement processes and strategies such as coding standards, testing methodologies and investments in tools and talent that identify errors; to increase the quality of software builds and decrease risks. This is imperative for brands and companies as the usability and quality of their software reflects on their brand image and reputation. You don’t want your company to die from a bug. People have perished in the past due to bugs in control systems software. Low code business applications platforms such as K2 help pacify this problem to a certain degree, however, every software application requires rigorous quality management. This is where Automated Regression Testing differs; it helps find problems before they affect end users. That’s why we are passionate about our PowerToolz offerings. jEyLaBs PowerToolz has been used by many K2 customers around the world for efficient testing, administration and management of their business critical K2 applications. Our official PowerToolz training course helps participants acquire some solid hands-on skills with the tool and gain in-depth technical understanding of how to leverage the K2 platform. This Course arms you with the knowledge on how the tool helps to automate many aspects of K2 such as testing, administration and management. 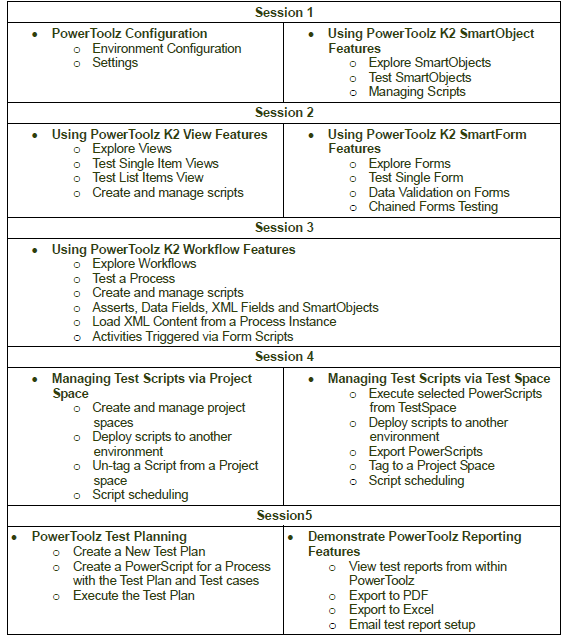 PowerToolz training course focuses heavily on how PowerToolz integrates with the K2 environment to deliver efficient automated testing, troubleshooting and even upgrade/migration capabilities. The training is portioned into five sessions with corresponding practical self assessments to ensure a comprehensive understanding of the material covered in each session. This is an online course delivered by our PowerToolz consultants. At the start of each session, time is allocated to provide participants to ask questions and fortify their knowledge. Both development and managerial staff are welcome to participate and contribute to the sessions. Our trainers cater for staff with various levels of technical knowledge and experience. The course also covers functional and administration features of PowerToolz in detail. It is delivered as 5 sessions and you can pick and choose the sessions. See the details below and email us at powertoolz@jeylabs.com.au to book your Training. When moving to the latest of K2, there are many important things to consider. jEyLaBs is one of the 10 or so global technology alliance partners of K2. We have invested heavily on leveraging K2 technology over a number of K2 versions over the many years. We have produced tooling to assist with Test automation, Migration, Administration, monitoring and troubleshooting of K2. As a result, We have acquired deep and wide experience migrating and upgrading applications, data and users on K2. Whether it involves File server drives, Lotus Notes, SQL, multi-forest ADs, SharePoint, ASP.NET, windows apps, Infopath, K2.Net 2003, blackpoint or blackpearl, we have been there assisting customers and partners succeed. jeylabs recently showcased deep integration scenarios including Chat-Bots, eForms and Workflow connecting with SAP, Office365 and SharePoint using Theobald software. Please check out this short video we produced from the footage at the #DWCAU held in Melbourne in Aug 2018. Find out more on how you can leverage your SAP investments further using Theobald. K2 has released K2 5.1 with new and improved functionality. The notables introduced in this version provide for rapid app development. This version introduces K2 Apps that help users easily install and build fully-functional K2 applications fast. Now you can install a set of pre-built applications into your environment from a catalogue directly. App Wizards can be used to generate customized applications from the provided templates to meet your needs. The revolutionary HTML5 based Workflow Designer, which is our favourite, has been improved with more features. Now developers can configure processes easier and faster. Accidentally added or deleted configuration can be reverted as well. Another key feature is the Warning Badges. These designer smarts will catch any infinite loop scenarios and detect recursions from happening during app deployment. Most design flaws can be picked up by this. K2 Form Designer is also enhanced in this release. Server-Side Rule execution is now available. This improves the execution performance of your SmartForms significantly. This feature reduces the number of calls to the server and reduces the loading times. From a security stand point it also reduces potential attack surface size. Number crunchers can rejoice. The ability to export the list view to an excel sheet is now an out-of-the-box feature. This version also includes two new responsive themes. From a security perspective, Property Encryption feature has been introduced to encrypt your property data that is saved in SmartBox based SmartObjects. The Authorization Framework adds the ability to secure your K2 artefacts and prevent them from being edited by unauthorized users. It also allows you to secure your K2 apps in the production environment so that the deployed configuration can be kept intact.